Ms. Kaur has 20 years of successful experience behind her, is a dynamic, result-oriented entrepreneurial leader with a strong track record and with good interpersonal skills who resolves multiple or complex issues as well as motivates staff to deliver maximum potential. She is MD & CEO of Comvision (India) PVT Ltd and Comvision Q Free, leading companies in system integration, e-governance as well as proven hardware/software solutions for automated toll management respectively. 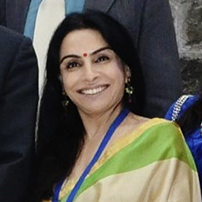 Harjinder founded her $5.0 million business in 1995 in India. In the last 21 years she has provided one stop shop for IT solutions in e-governance arena of India as well as Intelligent transport solutions and free flow traffic solutions. The company has done international strategic partnerships to give specialized solutions in Indian roads and highways sector apart from being a domain expert in implementing solutions for Govt. sector in India.